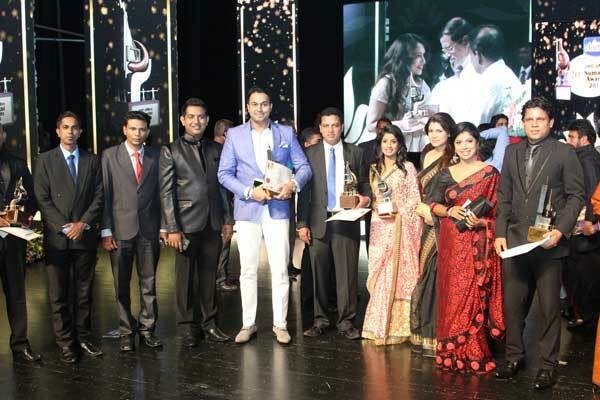 Wednesday 12th August 2015, Colombo: The EAP Broadcasting Company recently won sixteen awards in a variety of categories at the Sumathi Tele Awards held at the Nelum Pokuna Theatre in Colombo. The event was graced by the Chief Guest, His Excellency President Maithripala Sirisena along with leading actors, actresses, journalists and other veterans from the film and entertainment industry. Of the sixteen awards, the teledrama ‘Girkula’ by EAP’s Swarnavahini won six awards including ‘Best Performing Teledrama’ and ‘Best Teledrama Actor’ which was won by Janaka Premalal. Also for ‘Girkula’ Nilmini Tennakoon won the ‘Best Teledrama Supporting Actress’ award, Krishantha Rathnasiri received the ‘Best Teledrama Art Director’ award and Navarathna Gamage won the ‘Best Teledrama Music Director’ award. Also for their work in ‘Girkula’ P.Uhan Ovita won the ‘Best Teledrama Make-up Artist’ award and Mahinda Prasad won the ‘Best Teledrama Song Writer’ award. The EAP Broadcasting Company also netted multiple awards for the teledrama ‘Chess’, with Ananda Abeynayake winning the ‘Best Teledrama Director’ award, Arun Premarathna winning the ‘Best Teledrama Script Writer’ award and Mahendra Perera winning the ‘Best Teledrama Supporting Actor ’ award. Amongst numerous other awards the EAP Broadcasting Company also won a ‘Merit Award’ which was received by Richard Abeywardane for ‘Piththala Kondaruma’. The ‘Best TV Educational Programme’ award was won for the second season of the ‘Tokyo Cement All Island School Quiz’, the ‘Best Rupavahini Timely News Reporting’ award was won for ‘Live @ 8’ and the ‘Best Teledrama Television Media’ award was won by Swarnawahini. ‘Kiriamma Dhanaya’ won the ‘Best TV Timely Programme’ award and Thilini Perera received first place in the ‘Best News Announcer’ category. Since its inception and first ceremony in 1995, the prestigious Sumathi Awards recognize outstanding achievements in television and through this, the show aims to further encourage Sri Lanka’s television industry to grow and mature with the passing of time. EAP Broadcasting Company Ltd, a member of the EAP Group of Companies, has gained deserved national recognition and praise for much of its work and has earned Swarnavahini’s title of ‘Sri Lanka’s Pride’ by delivering innovative and pioneering teledramas, news broadcasting and other programming. EBC was established in July 1992 and operates leading TV and radio channels Swarnavahini, ETV, Shree FM, E FM and Ran FM.